The frequency cap determines how many times a user can receive this message per specified time period. For some campaigns you may opt to have it trigger every time a user triggers the campaign event, while others may be limited to a single message. Frequency caps can be added to specific campaigns, or can be applied globally across all campaigns. 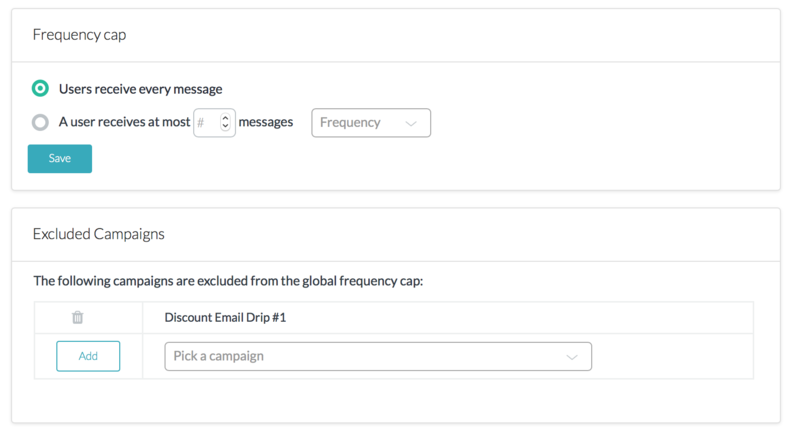 You can exclude specific campaigns from the global frequency cap, so all targeted users receive those campaigns, regardless of the number of messages received. Frequency caps are added to individual campaigns via the campaign builder. Send every time the trigger event happens (default), if you do not want to set a cap. Send this message to each other no more than X times to set the cap. Use the drop down menus to select the number of times the campaign should be triggered, in what time period. For information on allowing unsubscribes, see Allowing users to unsubscribe from campaigns. Global frequency caps are added via the Frequency cap page. In Connect, click the Settings icon ( ) in the left-side navigation. Users receive every message (default), if you do not want to set a cap. A user receives at most X messages to set the cap. Use the drop down menus to select the maximum number of times a user can receive a campaign, in what time period. In the Excluded Campaigns section for the Frequency cap page, use the dropdown menu to select the campaign you want to exclude. Click Add. The campaign is added to the exclusion list. If needed, you can remove a campaign from the exclusion list by clicking the trash can icon. How can I send a campaign to an external list of users?